Joint Space Narrowing: What Is the Significance? Evaluation Is It Getting Worse? X-ray images can detect joint space narrowing. In healthy joints, there is a normal amount of space between the ends of the bones that form the joint. The ends of the bones in a joint are covered by articular cartilage. In an unhealthy joint—one that is affected by arthritis—there is evidence of narrowing of the space between the ends of the bones in the joint, the result of cartilage loss. Articular cartilage serves as the cushion and shock absorber within the joint. When cartilage deteriorates or wears away, the affected joint becomes painful, stiff, and limited in its range of motion. When a joint is severely damaged and cartilage is totally worn away, the damage is commonly referred to as bone-on-bone. Evaluating arthritis usually involves measuring the joint space and judging whether it has narrowed. A weight-bearing X-ray is taken to look for joint space narrowing in the hips and knees. In osteoarthritis, the joint space narrowing is usually asymmetric. It varies in the different knee compartments of the same knee and surfaces of the hip joint affected. However, it is usually symmetric in osteoarthritis of the finger joints. While joint space narrowing is often the first sign of an arthritis diagnosis, it is just an indication. Joint space narrowing has a different meaning and shows up at different times in various types of arthritis. The age of the patient also factors into the significance of joint space narrowing. Other radiographic findings, as well as results of a physical examination and blood tests, must also be considered during the diagnostic process. Joint space narrowing may occur with various rheumatic conditions, including osteoarthritis, rheumatoid arthritis, inflammatory arthritis, erosive osteoarthritis, gout, or systemic lupus erythematosus. The wear and tear of osteoarthritis are characterized by joint deterioration and a loss of cartilage. 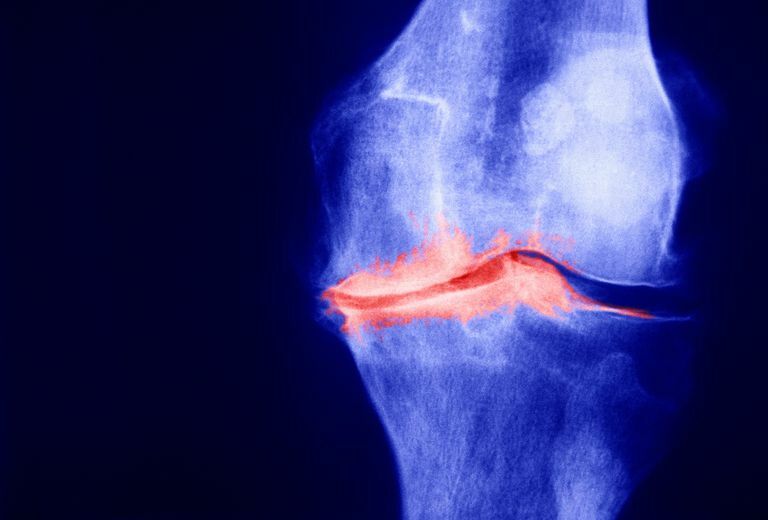 When doctors assess the severity of osteoarthritis, they use imaging studies to quantify joint damage by measuring the space that exists between the bones of a joint. Narrowing joint space indicates cartilage loss and worsening osteoarthritis. In the knee, joint space narrowing has been linked to loss of articular cartilage. However, meniscal damage also contributes to joint space narrowing. In one study, an MRI of the knees of 264 participants with symptomatic osteoarthritis was taken at the start of the study, then again after 15 months, and again after 30 months. Researchers concluded that alterations in the meniscus (non-articular knee cartilage) accounted for changes that resulted in joint space narrowing. Researchers explained that with osteoarthritis, articular cartilage becomes damaged and the meniscus can become displaced. Joint space narrowing is the consequence of changes to all of these structures. The amount of joint space narrowing is graded using a system called the Kellgren-Lawrence grading scale, which was first proposed in 1957. It measures the progression of osteoarthritis in the joints on a five-point scale. This system remains in use and is based on non-weight-bearing X-rays. Weight-bearing X-rays may be used to grade in the clinical setting and to predict disease progression. Some have called the evaluation of joint space narrowing as "time to joint replacement," but that does not take into account the many other factors that go into a decision regarding joint replacement. There are no medications that impact osteoarthritis progression at this time. The development of DMOADS (disease-modifying osteoarthritis drugs) has been disappointing, to say the least. Part of the problem, if we choose to call it a problem, in developing drugs that would slow down the progression of joint space narrowing is that the cause of osteoarthritis is more complicated than simple wear and tear. There are proinflammatory factors and proteases involved in joint tissue destruction associated with osteoarthritis. That said, without effective treatment to slow osteoarthritis progression, the significance of grading and scoring joint space narrowing is somewhat limited. Most osteoarthritis treatments are aimed at managing symptoms, and they are the best options available for reducing pain and enhancing your quality of life. Karsdal, MA et al. Disease-modifying treatments for osteoarthritis (DMOADs) of the knee and hip: lessons learned from failures and opportunities for the future. Osteoarthritis and Cartilage. 2016 Dec;24(12):2013-2021. Emrani PS, et al. Joint Space Narrowing and Kellgren-Lawrence Progression in Knee Osteoarthritis. Osteoarthritis Cartilage. 2008;16(8);873-882. Kellgren JH, Lawrence JS. Radiological Assessment of Osteo-Arthrosis. Annals of the Rheumatic Diseases. 1957;16:494-502. Jacobson JA, Girish G, Jiant Y, Sabb BJ. Radiographic Evaluation of Arthritis: Degenerative Joint Disease and Variations. Radiology. 2008;248(3):737-47. Loeser, Richard F. MD. Pathogenesis of Osteoarthritis. UpToDate. Updated June 21, 2016.